It was only a matter of time before the world had the first all-terrain electric skateboard. 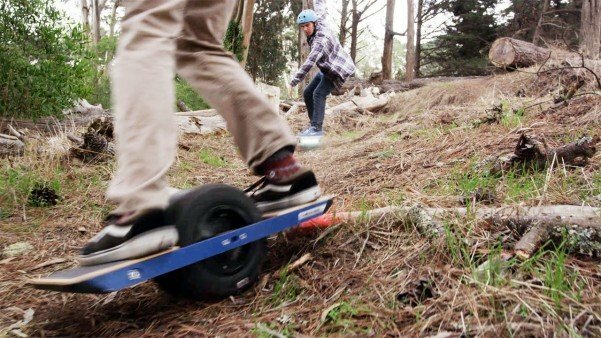 Though it’s been tried before, nothing looks as smooth and downright fun as the Onewheel. This revolutionary electric boardsport has recently gone from the lab to the dirt and is now available for purchase. With its wide single tire, this board can handle almost anything. Designed with self-balancing technologies similar to the “hoverboard” scooters, the Onewheel keeps the rider balanced with little effort. Just lean forward to go ahead, lean back to stop and push to side to side to steer like you would a skateboard with lose trucks. And the best thing about the Onewheel is that it’s completely electrically powered, so you don’t have to exert muscle, except to keep your balance, that is. By using state of the art lithium ion phosphate batteries, the Onewheel charges in less than an hour and a new type of brushless hub motor keeps the wheel running strong and reliability. MSRP $1,500… Order yours here.